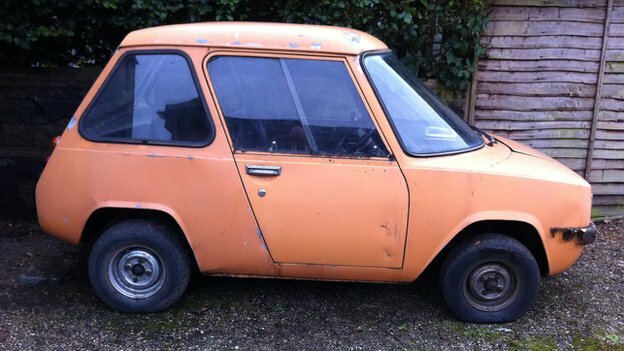 The Enfield Thunderbolt: An electric car before its time. With recent developments surrounding electrically-powered buses, the technology has been around longer than perhaps we have imagined. Earlier this year Nissan began production in Sunderland of the Leaf, the first electric car to be mass-produced in the UK. But 40 years ago, about 100 electric cars were built on the Isle of Wight to a design which was years ahead of its time. The Enfield 8000 was a prototype electric vehicle which emerged out of a competition run by the United Kingdom Electricity Council in 1966. Enfield Automotive beat rival bidders like Ford for the contract and made more than 100 cars at its works on the Isle of Wight. With a top speed of 48mph (77kph) and a range of up to 56-miles (90km), the car was aimed at low mileage urban users, and was expected to supply a much needed boost to Britain's export push. The vehicle was designed round a chassis of square cross-section steel tubing with panels made of lightweight aluminium. 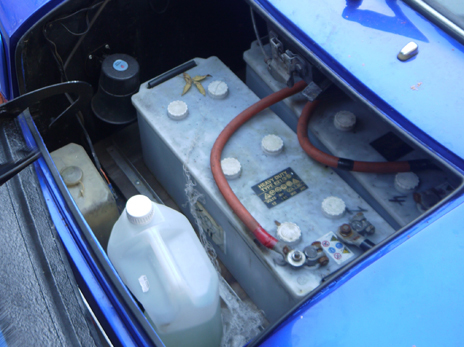 The car's power came from eight 6V battery monoblocks, and an onboard charger meant it could simply be connected to the domestic mains through a socket in the back. "The principle was much the same as a modern electric car," according to Radio 4 presenter Peter Curran, who has bought and restored an Enfield 8000. He says: "It was small, square and squat, but somehow futuristic with a beautiful curving windscreen. 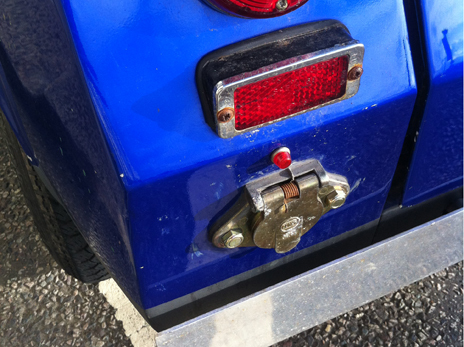 It had a cheekiness and came in a variety of colours - red, orange and blue. To the casual observer it looked a bit like a supersized Spangle." The car performed well and was favourably reviewed by the motoring press at the time. Its acceleration was considered impressive (0-30 mph in 12.5 seconds), it passed the Department of Transport's crash tests with flying colours and when placed in a wind tunnel showed it had a better drag coefficient than a Porsche. 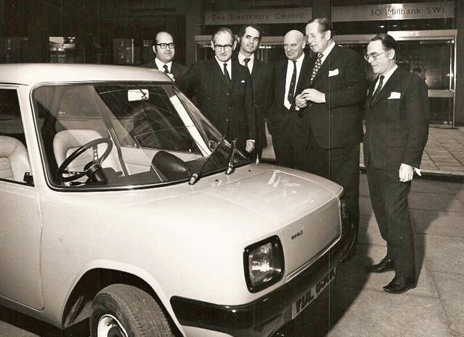 In November 1969, the Enfield 8000 was shown off at the first ever international symposium on electric vehicles. held in Phoenix, Arizona, where it caught the eye of Ronald Reagan, then Governor of California. "We took a truck across America with two Enfields on the back", says Sir John Samuel, who was leading the delegation. "Some people just looked at them and laughed, but Ronnie Reagan was astounded, and he said, 'Why can't we do this here?'" Governor Reagan offered to find a factory site in California, promising healthy subsidies and guaranteed orders. He even suggested giving the cars to all home-buyers on the island of Santa Catalina off the California coast, where the use of petrol-driven vehicles was - and still is - heavily restricted. But Enfield Automotive's owner John Goulandris, who was from a wealthy Greek shipping family, turned down Reagan's offer and chose to continue production in Cowes on the Isle of Wight. Some have suggested Goulandris rejected Reagan's offer because he was under pressure from the oil industry and had significant shipping business with them. Samuel, who went on to work on a number of other ground-breaking electric cars in the US, sensed the antagonism towards electric vehicles from those in the oil industry at the time. "We used to get irate phone calls from gas station owners across the States yelling 'You're putting me out of business!'" he recalls. In 1973 Goulandris switched production to the Greek island of Syros, although the parts were sent back to the UK to be assembled. "Along with the modest range, the main deterrent was really the price," says enthusiast Peter Williams. "It was being offered at £2,600. Back then, for that sort of money, you could buy two Minis." In May 1976, production stopped altogether. But many of today's electric cars - including those being manufactured by Renault, Nissan and BMW - owe a considerable debt to the Enfield 8000, which showed the world that a small urban car powered by rechargeable batteries was a real possibility. After being used as promotional vehicles by the electricity boards for many years, most of the Enfield 8000s were scrapped in the 1980s, but a handful remain in the hands of museums and collectors. As interest in electric cars increases and good examples get scarcer, the price of surviving Enfield cars is sure to increase.